New Hampshire’s statewide real estate and financial newspaper provides the most recent sales transactions, distressed property alerts and more every week. Available in print only with online access coming soon. 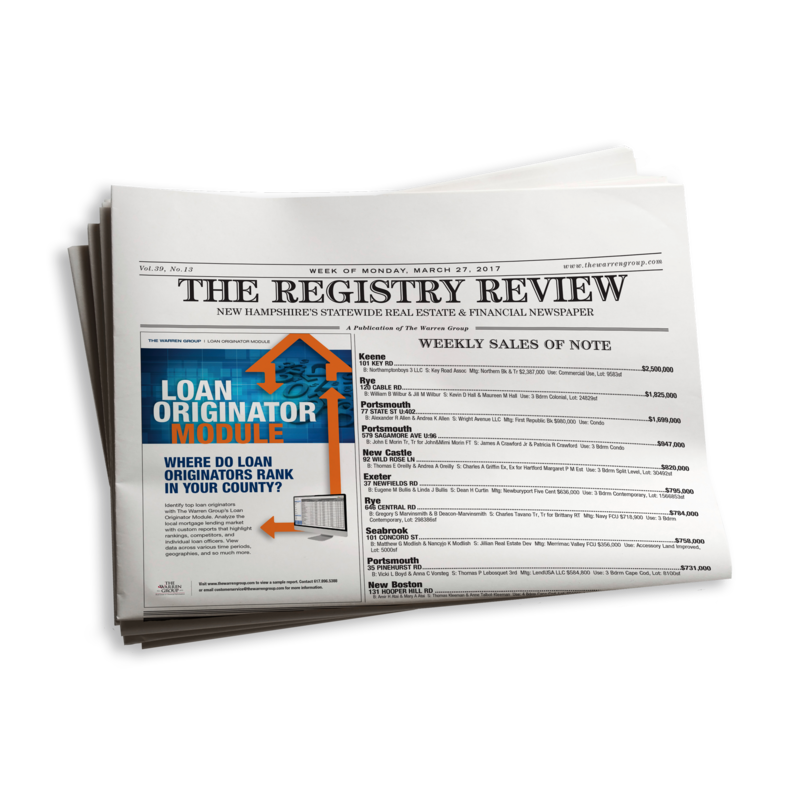 The Warren Group acquired The Registry Review, New Hampshire’s statewide real estate and financial newspaper, in 2014 with the purchase of Real Data Corp. Real estate appraisers, real estate agents and brokers, banks, and other industry professionals rely on this weekly newspaper to keep up with property transactions, new business opportunities, and to help them monitor the competition. Find business opportunities. Be the first to know New Hampshire property transactions with your one-year print subscription. Learn which properties are in bankruptcy: clearly separated as Voluntary, Chapter 13 and Chapter 11 bankruptcies, you’ll see the county and town of the properties, name and address filing, filing date and petition number. Plan for auction activity with weekly listings of foreclosures. You’ll find the attorney contact information, the deposit amount needed at auction, and the publication source where the notice is found. Get an edge on your business and know of property liens and attachments. You’ll find the entity filing the claim, the name and address of the property being held, the amount owed and the date of the claim. Find new projects with requests for bids and proposals. You’ll know the date and time RFP and RFBs are due, nature of request, requesting agency, next action required and more. To learn more about The Registry Review or to customize a marketing program unique to your business needs, call 800-356-8805 ext. 357 or email advertising@thewarrengroup.com.